Right at the beginning sweet peat smoke, accompanied by medical notes and some cold ash. Then smoked bacon arrives, nicely mixed with mouthwatering BBQ notes and delicious tinned apricots. Spicy hints of tobacco leaves, leather and nutmeg in the background. Overall very appealing. Strong on the palate with smoke and peat. Warming spices come through, such as cracked black pepper, dry oak, nutmeg and a hint of salt. Oily, slightly medicinal with a touch of ashes. Then sweet and creamy fruity notes of apricots and grapes take over. The dram's becoming increasingly juicier with a pleasant warmth towards the finish, wrapped in lingering peat smoke. The finish is medium long and warm with dry oak, subtle ashes and a touch of creamy sticky fruit jam. Water enhances the ashy and smoky character of this dram while the pleasant sweetness is pushed in the background. Still sweet and fruity on the palate with apricots and grapes. Slightly warm with tamed spices, ashes and a whiff of peat smoke. The finish is rather short, creamy with a hint of sticky apricot jam and black pepper on the tail. Wow - I am impressed! 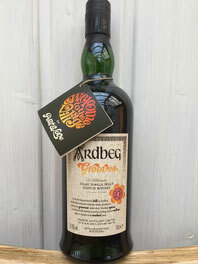 A strong, full-bodied Ardbeg with a great combination of peat, smoked bacon and sweet fruit notes. Nicely complex, warming and full-bodied. An excellent taste experience in which the finish could have been a bit longer. But I liked it very much and to me, this is a very successful Ardbeg Committee bottling.